Imagine owning originals of both the piano sheet-music and the 78-rpm record of “Alexander’s Ragtime Band” from 1911. Now picture them displayed together, hanging on your wall in a lovely frame, matted to suit your decor. What a gift for a parent, grandparent or music lover! This extension of my musical interests became part of YesterTunes when I invested in professional mat cutters and framing equipment in 1996. May I show you some samples of past work and tell you how to own a unique piece of art? 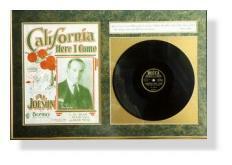 Either the sheet-music cover or the 78-rpm record can be matted and framed alone, with a suitable text caption or paragraph inset into the double-mat. But it is the combination of these two original elements of musical history that make this a one-of-a-kind display. The text block can be either a dedication (award, person’s name, retirement, birthday, anniversary or holiday gift, for example) or a history and explanation of the music shown. CONTACT ME to discuss your ideas of theme, colors, frame text, prices, schedule and shipping, using either your or my original pieces.